Book kindly sent by publisher for a review. My sister died on March the first which was really annoying because it was my birthday. It was our birthday. Laura was my identical twin. to feel lonely and invisible. Then someone totally different steps into her world. Lexi is an unpredictable force of nature. She has wild red hair and wears an eye patch. What happened to her? Where is she from? 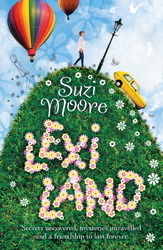 Lexi is a mystery to Emma, a mystery which slowly unravels as they become friends. With Lexi’s help, Emma finds the courage to ask questions about Laura’s death—but will she be able to cope with the answers she uncovers? This is one of those magical books that make you laugh and cry simultaneously. From the first line, I knew I should feel sad, but then the main character says something that makes you laugh and you find yourself furtively looking around to make sure no one saw you laughing at a tragic situation. The story is told in first person from Emma’s point of view, so you come to terms with the situation and the death of her sister at the same time as she does. It becomes clear as the story progresses that Emma isn’t fully aware of all the facts that influence her life, and the author pulls the wool over our eyes, holding it tightly until she is ready for us to read the truth. There were events within the story I really didn’t see coming and to discover that in a children’s book, I was extremely impressed. Emma is a child in the story and I really think the author has captured her innocence and adolescent nature perfectly. Emma is dealing with an adult situation and struggling to come to terms with it as her parents are so involved with their own grief they cannot see how Emma is self-destructing before their eyes. Emma is very lonely and you just want to hug her. I loved her to bits! The other characters were captivating and believable. Emma’s granddad really caught my attention; his travels were interesting and colourful. I loved that he lived on a houseboat. Lexi was enigmatic and really helped Emma to shine again. I think the author got the twin relationship spot on, especially the bickering part between them. Being the parent of identical twins, I was really impressed with the way they were written. The playground arguments and the bullying within the playground were extremely real scenes to me. The trials and tribulations of friendship groups play a big part of this book and it shows how difficult it is to find the right friend. I found the story to be very realistic and extremely poignant at times. I loved the way all the dialogue was set out. It was laid out like speeches in scripts. There is an element of the paranormal within the book, which added an extra touch of magic to whole story. A magical children’s novel that blends sadness and happiness so naturally to create a gorgeous contemporary tale. This sounds different and good. Need to check it out. It is a great book. Just right for the 9 to 12 year old market. This sounds amazing. I have to read it now!